Sign up for free and just shop with uSwitch - Energy Comparison as normal. Our members earned £130,000+ at uSwitch - Energy Comparison in the past month. Cashback will only be approved for new customers to a supplier. uSwitch - Energy Comparison cashback can be earned simply by clicking through to the merchant and shopping as normal. uSwitch - Energy Comparison Cashback is available through TopCashback on genuine, tracked transactions completed immediately and wholly online. Cashback will be uplifted upon validation. Save money and cut the cost of your energy bills by changing energy provider through uSwitch. The online comparison and switching service helps households make a saving on a wide range of products and services by finding cheaper deals. The uSwitch gas and electricity energy saving service will compare all of the energy prices available to you to show you if you are on the best tariff or whether you could save on your fuel. It is not just your utility bills uSwitch can help you save money on as they also compare heating cover, home phone providers and financial products. All the benefits of the service they provide are also available to business customers, who can switch power supplier to cut overheads. As uSwitch charge suppliers a fee when they switch customers to them, they can provide their comparison service for free, while the fact they have commercial agreements with some suppliers means they can offer exclusive deals which are not available as standard to customers who go direct to them. The data they use to compare prices comes straight from the suppliers, who are continually monitored to ensure accuracy. 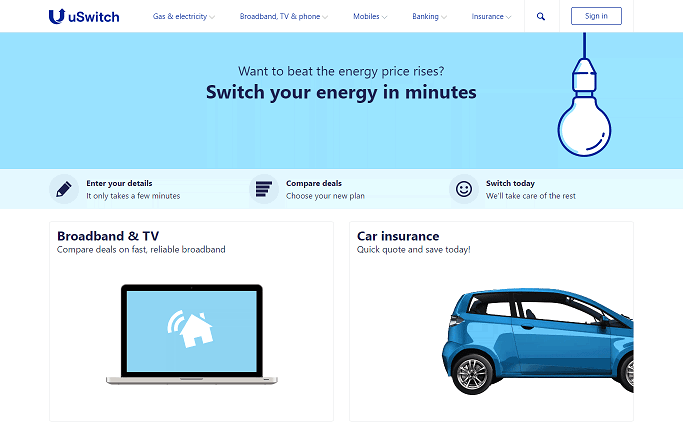 uSwitch compare prices from leading energy suppliers, including British Gas, E.ON, npower and SSE, and by entering your postcode and energy usage habits, you can get a bespoke comparison for your home. They will compare the entire market to find the best energy deals available in your area, while if you confirm your switch with them, you can sit back and relax as uSwitch will notify your new energy supplier. You can compare gas, electricity or both, while if you do decide to switch, there will be no interruption to your supply. Your new supplier will contact your old one and agree a switching date with them, and send you a welcome pack, which will outline what you have agreed and tell you what will happen next. Having your latest energy bill will help you to provide accurate information about your usage, but if you do not have one, they can work it out by asking you a few questions. You can now save on your bills by downloading the uSwitch app to your iOS or Android device from the App Store or Google Play. You will be able to compare gas and electricity prices and find the cheapest deals by scanning your bill's QR code, which will allow you to get instant price comparison results. Compare the whole market to find the best plan for you, then switch in minutes anytime, wherever you are. With the app, you will receive alerts which will inform you of how the switching process is progressing, while as your details will be saved on the app, they will be able to continue to track the market and let you know when you will be able to save again by switching suppliers. The Confidence Code is managed by Ofgem, the UK energy market regulator, and is a voluntary code of practice for online domestic price comparison services which is designed to help consumers in terms of making it easier and more reliable to switch energy, as well as providing reassurance. The Confidence Code requires those signed up to it to provide independence and impartiality, as well as present tariffs in a fair way and ensure any information presented is accurate. uSwitch have also been awarded the Internet Crystal Mark by the Plain English Campaign - an independent body which champions the use of simple language in public communication - and are also authorised by the Financial Conduct Authority (FCA). The independent organisation was set up by government to regulate financial services in the UK and help customers compare money and insurance products. The FCA promotes good business practice and fair financial markets to help people get a fair deal. uSwitch is an online comparison and switching service which helps you save money on a range of products and services. They can help you make savings on your gas & electricity, heating cover, home phone & communications and insurance & personal finance products by comparing all the deals available to you. uSwitch has commercial agreements with some suppliers across all of their services. They charge suppliers a fee when they switch customers to them, which allows them to provide this service to customers for free. These relationships sometimes allow them to negotiate exclusive deals which are not available directly from the supplier. The data they use is provided by suppliers, their agents or third party providers. uSwitch are part of the Confidence Code, which is managed by UK energy market regulator Ofgem. It is a voluntary code of practice for online domestic price comparison services which is designed to help make the switching process easier. uSwitch are also authorised to help you compare money and insurance products by the Financial Conduct Authority (FCA), which promotes good business practice and fair financial markets to help customers get a fair deal. uSwitch try to include as many suppliers and products on the market as possible in their comparisons to enable you to find the cheapest or best product or tariff for your needs. Switching suppliers saves their customers hundreds of pounds on their bills and uSwitch do not mind who you switch to, as long as you find the right deal. Save money and cut the cost of your energy bills by changing energy provider through uSwitch. The online comparison and switching service helps households make a saving on a wide range of products and services by finding cheaper deals. The uSwitch gas and electricity energy saving service will compare all of the energy prices available to you to show you if you are on the best tariff or whether you could save on your fuel. It is not just your utility bills uSwitch can help you save money on as they also compare heating cover, home phone providers and financial products. All the benefits of the service they provide are also available to business customers, who can switch power supplier to cut overheads. As uSwitch charge suppliers a fee when they switch customers to them, they can provide their comparison service for free, while the fact they have commercial agreements with some suppliers means they can offer exclusive deals which are not available as standard to customers who go direct to them. The data they use to compare prices comes straight from the suppliers, who are continually monitored to ensure accuracy.